A Blythe doll I really want is strawberries and creamy cutie! The invention of Hugo cabrent is a great book! I hope I spelt that right! I ordered a urban cowgirl too! She has not come yet! And thanks for making me that blog signature! 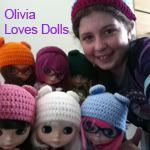 Hi Olivia, thanks so much for commenting!! I'm great, how are you? Strawberries and Creamy Cutie is soo awesome I would like to get her as well!! I LOVE the INvention of Hugo Cabret SO SO much!! I love art and I think the drawings in it are just AMAZING!! My friend has it and whenever I go to her place I always read it so that is why I am asking for it for Christmas. ooh, really? Cool!! Do you know what you are going to call her? No problem! Thanks for being so kind! Her name does really suit her!!!!!!!!!!!!!!!!! Our life and world now just barely turn into the counterfeit and its excellence like that since we miss the nature and partake http://www.aussiessay.net innovation in our life. So should make the garden in our home and developing tree and blooms and make the parks in the neighborhood or in alternate spots we make our reality wonderful.